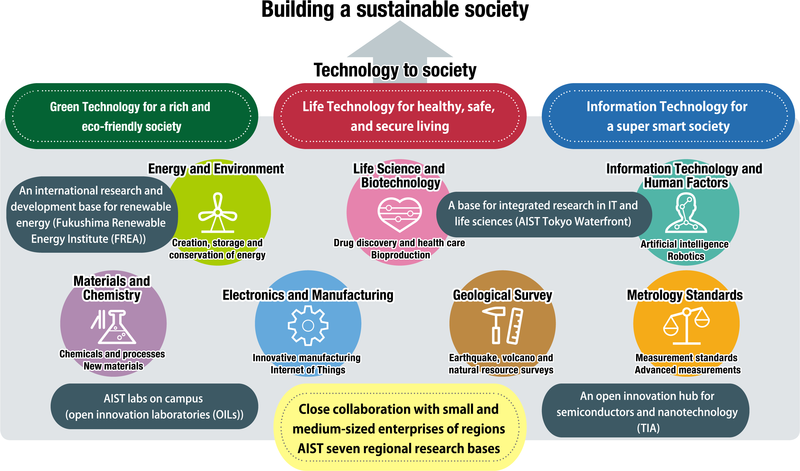 AIST, as a core and pioneering existence of the national innovation system, has about 2000 researchers doing research and development at 10 research bases across the country, based on the national strategies formulated with the changing environment involving innovation in mind. AIST is also actively building a global network by, for example, signing memorandums of understanding for comprehensive research cooperation (MOUs) with 30 major research institutes around the world. We endeavor to achieve a rich and eco-friendly society through “Green Technology,” healthy and safe living through “Life Technology,” and a super smart society through "Information Technology," with the hope of building a sustainable society.